Scouting for a source of supplies on the planet Zardak, Apollo, Starbuck, and Athena are captured and enslaved to work in a Cylon metals mine. Apollo, Starbuck, and Athena arrive on the planet Zardak to scout for a source of supplies. But it turns out there is a small human settlement on the planet ruled by a petty dictator named Mendrix who has enslaved most of the population in order to mine metals for his Cylon allies. The Cylons detect the Galactican shuttle, but do not wish the human fleet to become aware of their presence there, so Mendrix is ordered to take care of the intruders. Mendrix sends an armed hovercraft to attack the small ship after it lands. The three Colonials take off again to escape the guns but are shot down out of the sky and captured to become additional slaves in the mines. On the Galactica, Boomer volunteers to search for the missing warriors and takes another shuttle down to the planet, not realizing Boxey and Muffit have stowed away as well. In the mines, a slave guard who is actually a member of a secret resistance to Mendrix's rule helps Apollo, Starbuck, and Athena to escape their toil, but has no weapons to offer them except his whip. Meanwhile, Boomer's shuttle has also been detected by the Cylons and another hovercraft is sent to shoot it down. But Boomer turns the tables and destroys the craft. One soldier manages to ditch from the falling vehicle, but lands in swamp and is soon mired and being sucked down into its depths. Boomer and Boxey lower a grapple down from the hovering shuttle to rescue him and the grateful man agrees to help them infiltrate the mines to rescue the imprisoned warriors. Boomer's attack on the mining compound just happens to coincide with an attack on the control center by Apollo, Starbuck, and Athena and they are reunited. During the battle, the Cylon commander eviscerates the cowardishly babbling Mendrix and then is himself destroyed by Boomer. As our heroes flee the site, the Zardakian soldier who'd befriended Boomer and Boxey gets on the comm system and announces over the loudspeakers to his people that the Cylons have murdered Mendrix and they must rise up against the honorless robotic overlords. As the rebellion spreads, our heroes escape Zardak in Boomer's shuttle. I've chosen to place this story during the fleet's trek through the new galaxy where it encounters several "lost" Colonial settlements that began in "The Long Patrol" and ends some time before "The Living Legend" Part 1. In this story, we see there is a small human civilization or settlement ruled by a petty dictator who has enslaved most of the population and they seem to speak the same language as the Colonial visitors, so they are at least distantly related. It is also stated several times in the story that the Colonial patrol is looking for a "supply source" and looking for human life, making it sound like they are expecting (or at least hoping) to find a settlement that will have manufactured "supplies" as opposed to just searching for indigenous food, mineral, or fuel sources. The story itself is untitled. I borrowed the title "Enslaved" from the Battlestar Galactica Chronology on the Look-In wiki (this site was also the source of the writer and artist credit on the story since there are no credits on the story itself). The writer may have named the watery world Zardak for the species of cyprinid fish of the same name found in Russia and Iran (also known as the Caspian Barbel). The Cylons are seen to use previously unseen airboats in their search for the escaped human slave through the swamps of Zardak. On page 3 of the story, the Galactican shuttle is seen to have a large number "2" painted on the roof. Presumably, this indicates a designation as shuttle #2. Later, Boomer's shuttle on page 13 has a large "3" on the side; but, as it returns to the Galactica at the end of the story, Commander Adama refers to it as "shuttle one"! In this story, we once again see that the humans on this planet of Zardak seem to speak the same language as the Colonials, even though there does not appear to be an obvious connection between the two civilizations. On page 19 of the story, an unusual Cylon model is seen at their base on Zardak. Perhaps this is some variation of an IL-series. Also on page 19 of the story, the Cylons activate their seismosonic detector to see if anything is moving within the base and reveal the escapees' location. "Seismosonic" is not a real word, but obviously is intended to convey a meaning of detecting motion and sound (or possibly motion through sound). The ship of the fleet seen drifting behind the Galactica on page 21 appears to have part of the word "freighters" stenciled on its side, probably from the name of the company that owned the ship back in the Colonies. Oddly (and amusingly), Starbuck's whip on page 23 of the story seems to make the sound of "shassa!" when cracked. 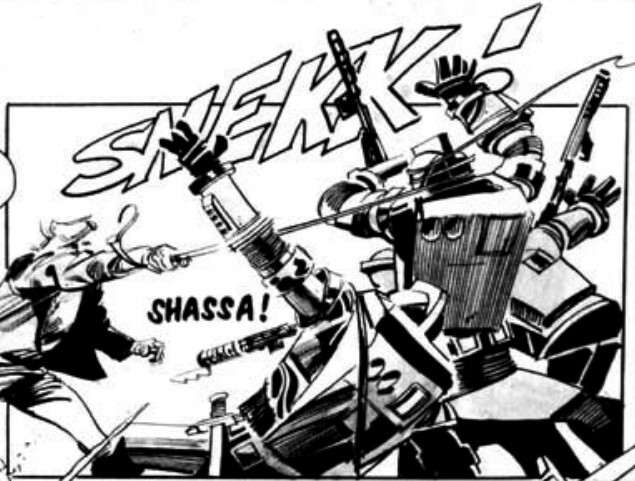 Starbuck was already the Han Solo of Battlestar Galactica, now with the whip he's the Indiana Jones as well! What became of the human survivors of the revolt on Zardak? Even though they seem to have toppled Mendrix and his Cylon allies at the base, it seems likely the Cylon Empire will simply send reinforcements to reestablish their dominance there (and possibly slaughter the remaining humans).